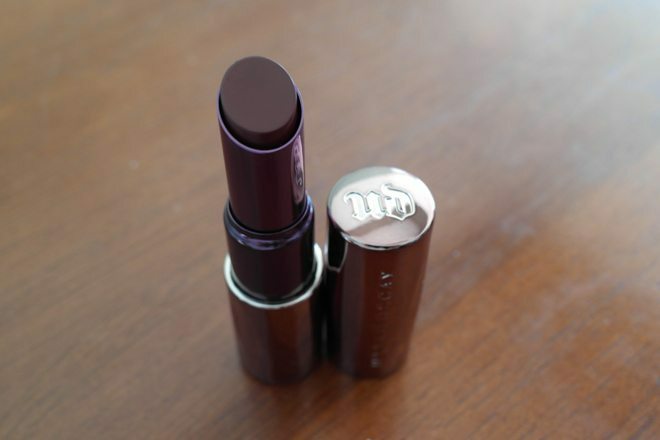 Review: Urban Decay Revolution Lipstick in "Shame"
Although I am a huge fan of Urban Decay’s eyeshadow palettes (Naked 1 and Vice 2 are my all-time faves) but in reality, I don’t wear eyeshadow unless I’m going out or for special occasions. I’ve never quite mastered the monolid eyeshadow techniques, so instead, I choose to focus on my lips. I love a good statement lipstick. Red lipstick is my go-to, but when I read about Urban Decay’s Revolution lipstick line, I decided maybe it was time to branch out to some other fun colors. The first shade that I purchased was a gorgeous hot pink (that almost looks red in some lights). You can check out Catfight in frmheadtotoe’s favorites video. I chose to review the color “Shame” because it truly lives up to the “Revolution” title. It is the most extreme lipcolor I’ve ever owned. In the tube, it looks nearly black. Intimidated by the bold color, I also bought a shade called “Manic” which was a more subtle rose lipstick for everyday wear. I had been dying to partake in the Oxblood lip trend, but found that a lot of the dark shades leaned more towards the purple side of the spectrum. “Shame” seems more of a deep red to me, which I love. So dramatic! Urban Decay Revolution lipsticks are truly my new HG lippies. If my new house and impending wedding hadn’t taken such a toll on my budget, I would probably buy these in every shade. I definitely plan to purchase a good neutral soon. The color payoff and creamy texture of these lipsticks are to die for. I used Urban Decay’s ozone lip liner around the edge of my lips to prevent feathering, and “Shame” did not bleed at all. It was more patchy when first applied than the other Revolution lipsticks, but after rubbing my lips together a few times, it evened out. And the beautiful color lasted for hours, including through my final tasting with my wedding caterer! It did come off a bit on the drinking glass, but faded into a pretty and even stain, so I didn’t mind. I wish I had the guts to wear this color on a regular basis, but love having it in my arsenal for those days when I want to release my inner-vamp. Would have given 5 stars if not for the slight patchiness of this particular color, but it’s definitely a must-purchase for anyone bold enough to rock the dark lips! P.S. My Star Wars Muscle Tee, which I bought because my fiance was shopping with me and completely nerded out when he saw it on the rack, is from Forever21.